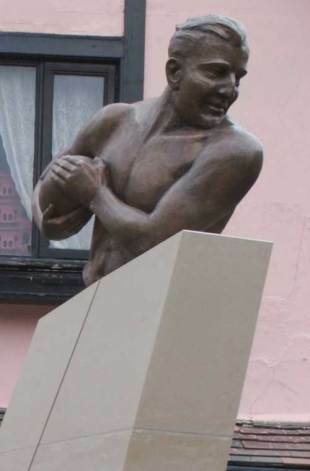 A statue of Alexander Obolensky, the Russian prince who played rugby for England, was unveiled in Ipswich today thanks in part to a donation from Chelsea FC owner Roman Abramovich. Obolensky became known as the 'flying prince' after scoring two superlative tries on his international debut in 1936, which helped England to their first victory over New Zealand. Abramovich added to cash from the Rugby Football Union, local businesses and public donations in raising the £50,000 required for the 15-foot bronze and stone statue. Obolensky's aristocratic family fled the Russian Revolution in 1917, a year after he was born, and settled in London. His father Prince Serge had been a commander of the Tsar's Imperial Horse Guards in St Petersburg. Prince Obolensky went to Trent College, where there is now a building named in his honour, and Oxford University but he was not granted British citizenship until 1936, shortly before the New Zealand game. Obolensky, then 19, had been called up for England after winning a blue for Oxford in the 1935 Varsity match. He cut off his wing magnificently to score two tries in England's 13-0 victory, which remains their biggest win over the All Blacks. Obolensky played just four Tests for England but his legend was created in that one match against the All Blacks. He joined the RAF and was killed during training in 1940 when his Hurricane crashed at Martlesham Heath, near Ipswich, on March 29. He is buried at the Ipswich War Cemetery. The statue was unveiled in Ipswich today by Princess Alexandra Obolensky, the niece of England's flying prince. "I learned a lot about him from Bernard Gadney, who captained England in that match against the All Blacks and who visited his grave on a regular basis," she told the rfu.com podcast. "He was a lovely man. Modest and unaffected but the same time a rather dashing figure with his blonde hair, blue eyes and a Prince. He was quite sought after on the social scene and a bit of a celebrity in his time. "He was a fantastic and committed sportsman who pioneered the lightweight rugby boot. He was very passionate about England who he was delighted to play for and serve during the war."